Gigantism and acromegaly are rare clinical entities caused by growth hormone (GH) hypersecretion. Their main difference is the status of the epiphyseal growth plates at the time of the GH hypersecretion; gigantism occurs during childhood when growth plates are not yet fused, and acromegaly occurs after epiphyseal fusion. The most common cause of both gigantism and acromegaly is a benign GH-secreting pituitary tumor (somatotroph tumor) that occurs sporadically. 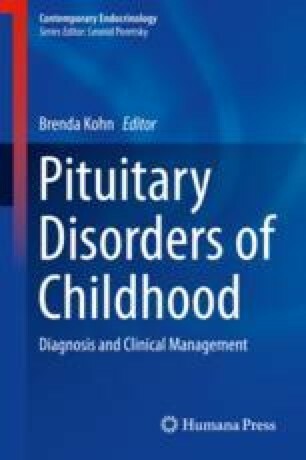 However, both disorders can occur in the setting of known genetic syndromes, including familial isolated pituitary adenoma, X-linked acrogigantism, Carney complex, multiple endocrine neoplasia type 1, McCune-Albright syndrome, paraganglioma, pheochromocytoma and pituitary adenoma association, and neurofibromatosis type 1. Typical clinical features include coarse facial characteristics with frontal bossing and prognathism, excessive sweating, and enlargement of the hands and feet. Clinical manifestations can be broadly categorized into local effects from the pituitary tumor and systemic effects of the GH/IGF1 excess. Measurement of serum IGF-1 is the best screening test for gigantism and acromegaly. Diagnosis is confirmed by failure of suppression of GH to less than 1 μg/L after a standardized oral glucose load. The goal of treatment is to normalize GH secretion and correct clinical symptoms while preserving anterior pituitary function. Surgery is the first line of therapy for patients with a distinct pituitary micro- or macroadenoma. Medical treatment consists of three different classes of medications: somatostatin analogues, dopamine agonists, and growth hormone receptor antagonist. Radiotherapy may be used as an adjuvant therapy when surgery and medical therapy are unsuccessful.